“Log In & Learn Now” reads the anchor text of the latest PayPal phishing email. It’s the only original part of the email. The rest of the email resembles many PayPal phishing emails. It follows the standard line that your PayPal account has limitations. To remove the PayPal limitation, click on a link. This will take you through the process of verifying all your account details. The limit on your PayPal account is then removed. The reality is all your personal details are stolen by criminals. This is another phishing campaign targeting PayPal users. The email is nondescript, as Figure A shows. No PayPal logos or branding are present. The subject line is long winded: “Your account access has been limited. 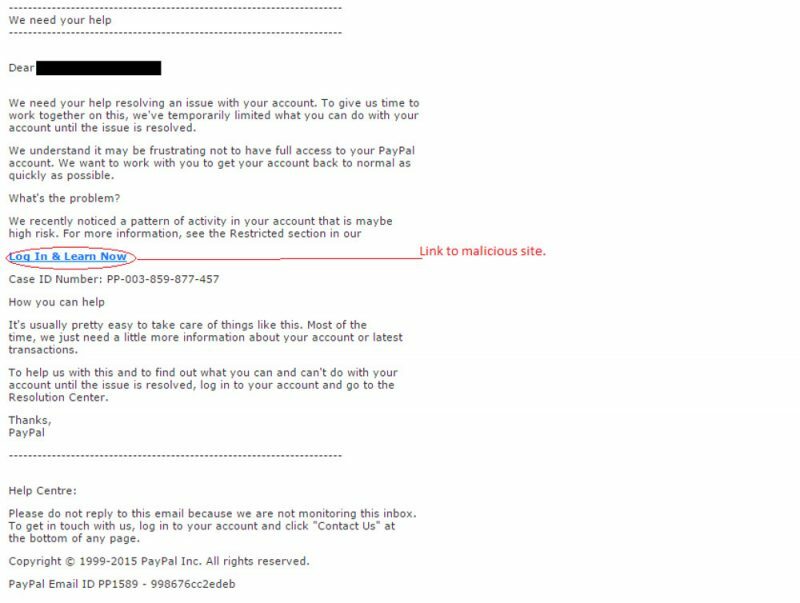 Learn how to remove this limitation.” The sender of the email is “Service PayPal”. The actual email domain is not a PayPal domain. The greeting is semi-personal; the email address of the recipient is used. There is a Case ID number at the centre of the email. There is one link in the email. The anchor text of the link is “Log In & Learn Now”. The rest of the email is in plain text. The bottom of the email has a basic copyright notice and a PayPal email identifier. The two items that make the email look realistic are the email identifier and the case id. This email is not convincing, but may still snare users. There are several indicators that the email is not genuine. The obvious indicator is the absence of any PayPal logos. Another flag is the greeting. PayPal use the name of the account holder. Finally, the link is not a genuine PayPal link. Mousing over it shows that it leads to a malicious site. The malicious site does start with PayPal. This is an attempt to fool the recipient.